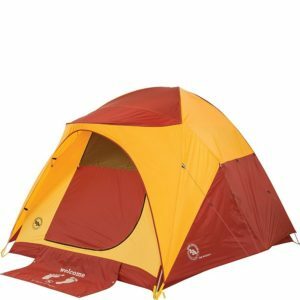 The Big Agnes Big House tent is perfect for a family weekend outdoors! The Big House is large enough to sleep six comfortably. 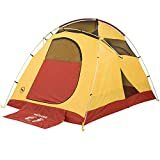 This enormous three season tent is a snap to set up with color coded poles that quickly clip onto the tent. The Big Agnes Big House has 75 inches of interior room, so even Dad won’t have to duck inside. The walls are lined with gear pockets to hang flashlights, lanterns and other weekend accessories. Campers say the fly is kind of gimpy as it covers the sides but does not fully cover the doors. The doors are waterproof but to get the full advantage of waterproofing and fly space, you have to get the vestibule! They love the pole to tent interface, and say the sleeves for the poles are pretty tough. They note that the entire package is actually fairly light (the website says 13 pounds) and it all packs up into a briefcase style carrying case.